Reaction Injection Molding is the Most Advanced Process for Polyurethane Parts Molding. The way we work gets a very positive reaction. 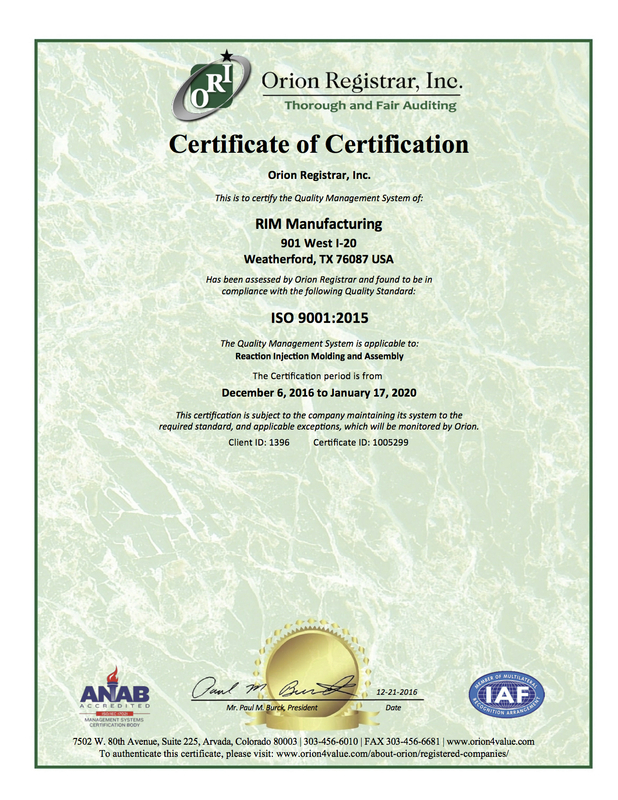 Founded in 1979, RIM Manufacturing, LLC has grown to be one of the largest independently owned plants in the country specializing in custom Reaction Injection Molding. 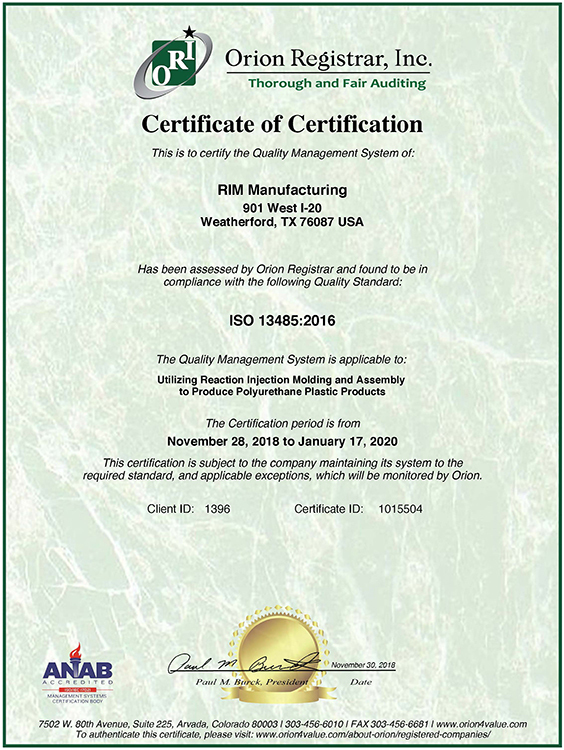 ISO 9001:2015 and ISO 13485:2016 Certified for RIM Molding and Electro-Mechanical Assembly, we optimize RIM processes for our clients with our significant design expertise. While we are one of the most experienced leaders in the business, our plant floor space that exceeds 45,000 square feet and our three-acre site allow us to be flexible in our process, nimble in our response to client needs. And our Central US location in the Dallas/Fort Worth area can save time and cost for transportation. When you consider all these advantages, you’ll have to have this reaction: RIM Manufacturing is uniquely positioned to accelerate your company’s success. The reaction makes all the difference. Reaction Injection Molding relies on low-viscosity liquid polymers expanding, thickening and hardening in the mold through a variety of chemical reactions at much lower temperatures. So our processes can accommodate much more intricate designs than ordinary injection molding or thermoforming and offer a greater range of desired weight, strength, density and hardness characteristics. The slightly longer production time of Reaction Injection Molding is more than offset by its benefits to design, flexibility and cost-efficiency, not to mention the wide ranges of part size, design uniqueness, and overall superiority. These processes ensure that your customer and end users are going to give your products a better reaction. A better reaction to your design. Reaction Injection Molding gives you design options otherwise impossible. Accommodating small to very large parts, it imparts structural integrity, tight tolerances and greater ranges of wall thickness within the same part. Plus, several parts can be combined into one. Design solid, elastomeric, rigid foam, or flexible foam parts with your precise characteristics of impact resistance, dimensional stability and strength, wear- and corrosion-resistance, thermal insulation and more. Create polyurethane parts that over-mold other materials like metal, wood or glass or even other parts such as cable, valves or circuitry. Designs appreciated for enhanced appearance and performance – isn’t that the reaction you’re looking for? Imagine the reaction when your parts perform better and cost less. Our aluminum molds typically cost 70% less than steel molds and last longer, since they are used at lower pressures and temperatures. They may never need to be replaced and can be modified much less expensively. Lead-time to production is also considerably less, reducing your time to achieve profitability. Our parts costs are very competitive with other polyurethane processes and almost always less expensive for parts which are large or have high demands for structural integrity, unusual or complex geometry, and design tolerances. Over-molding and combining several parts into one can bring about further cost savings. When cost savings combine with production advantages, you get a very positive reaction.